Sen. Bernie Sanders speaks Wednesday night at the Veterans Memorial Coliseum in Madison, Wis.
Nearly every last one of the 10,000 seats in Madison’s Veterans Memorial Coliseum was spoken for Wednesday night when Sen. Bernie Sanders (I-Vt.) took the stage. “In case you haven’t noticed, there are a lot of people here,” he said. On the day his chief rival for the Democratic presidential nomination, former secretary of state Hillary Clinton, broke an early-campaign fundraising record, Sanders broke one of his own. Those people were definitely feeling the Bern. Waving blue and white placards bearing the Vermont senator’s name, the crowd interrupted him frequently to cheer his calls for “a political revolution” and to boo his references to “the billionaire class,” the Koch brothers and Wisconsin’s own Gov. Scott Walker, a Republican candidate for president. Wednesday’s record-breaking rally followed similar recent events in the equally progressive enclaves of Minneapolis and Denver, which drew 3,000 and 5,000 people, respectively. 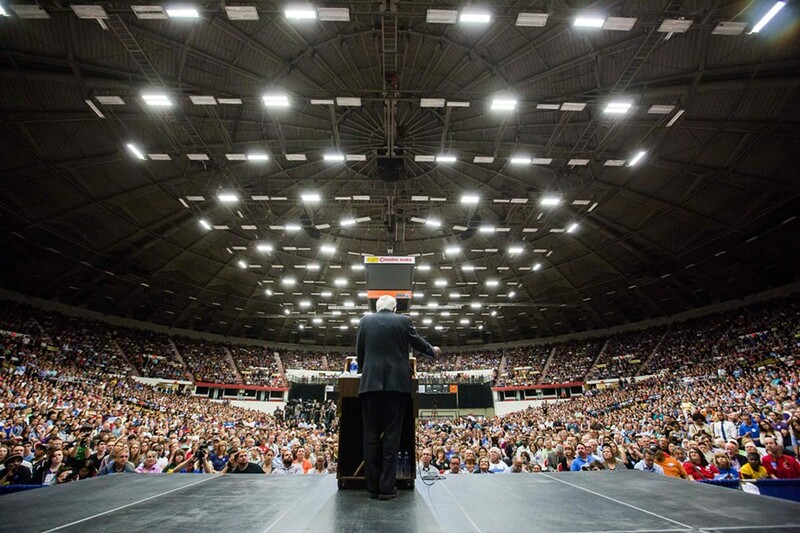 As Politico’s Jonathan Topaz observed, Sanders has adopted the time-tested strategy of courting major crowds in liberal bastions in order to solidify his status as Clinton’s chief rival. 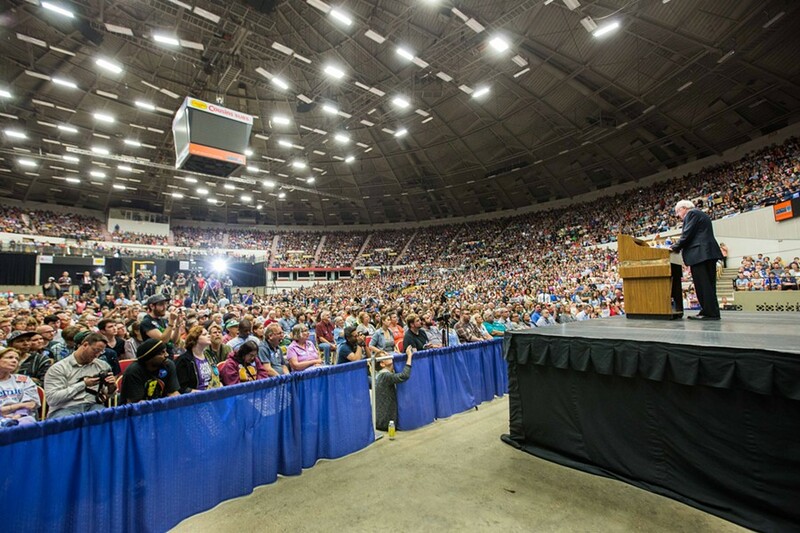 Sanders is hardly a stranger to Wisconsin. He has appeared frequently over the past 13 years at the Fighting Bob Fest, an annual progressive gathering in nearby Baraboo. At Wednesday’s event, disability rights organizer Jason Beloungy said he first saw Sanders speak at the festival a dozen years ago. Cheryl Pieper and Joan Borzym, who work together at an Illinois elementary school, said they drove two and a half hours to hear Sanders speak — and they weren’t disappointed. Both said they were confident Sanders could win the presidency. “The roar of the crowd tonight—” Pieper said, before her friend interrupted her. “He can definitely win,” Borzym said. Sanders — and much of his audience — seemed to agree. 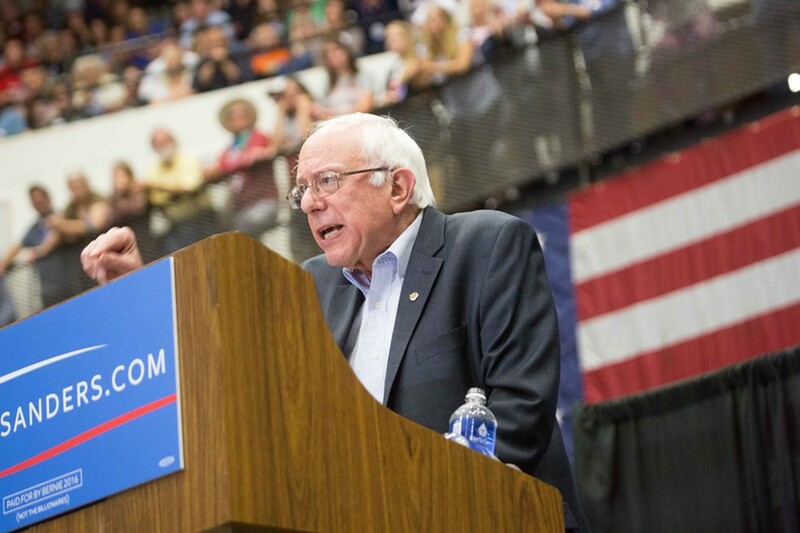 Before he could finish his sentence, the crowd's cheers drowned out Sanders’ voice. Twenty second later, he picked up where he left off. Seven Days is following Sanders from Wisconsin to Iowa, where he’s scheduled to campaign from Thursday through Saturday. Visit BernieBeat.com for the latest.